Sure you know that keeping receipts are important, but did you know that copies of a credit card statement listing the expense are considered NOT ACCEPTABLE by the IRS? Did you know you need to include the starting and ending odometer readings and the date of the trip for all of the mileage logs? What about remembering to account for the remaining days in December after your credit card statement? Don’t give up those days or weeks until the end of the year! 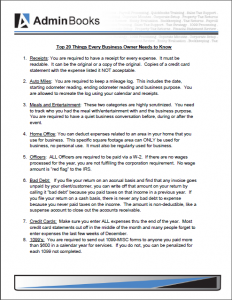 Renee has put together 17 more great tips for Business Owners in this free report. Please enter your address at the top of the page, and we’ll send the report straight into that Inbox. How’s that for instant satisfaction? 1. How do you retain your receipts? 2. How do you account for Meals and Entertainment? 3. Why do Officers in your Corporation MUST need to be paid by W-2? 4. Why is it important to send out 1099-MISC to anyone you paid more than $600? Thank you for your interest in Top 20 Things Every Business Owner Needs to Know Real Estate Investing eBook. You'll also receive periodic emails from us with powerful ideas on real estate investing. We respect your email privacy and you can unsubscribe at any time.